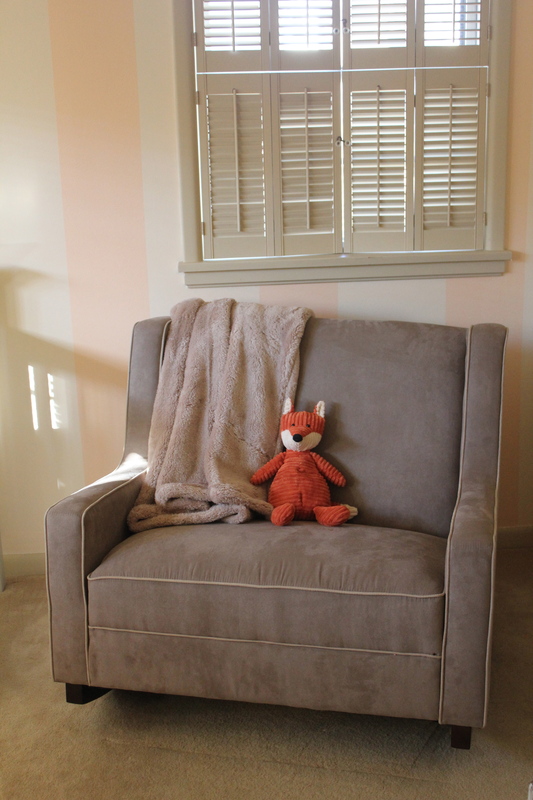 The Nest Revealed: Peach & Gray Fox Nursery for Our Baby Girl | mrs. and the misc. It’s finally time to reveal the nursery we’ve created for our baby girl. Yesterday marked my 38th week being pregnant, which means I have a maximum of three weeks left (that’s a week extra if she’s late). Your guess is as good as mine in terms of when she’ll decide she’s ready to come out and meet us, but we can’t wait. I hope she loves her little nest. This was my original inspiration, remember? 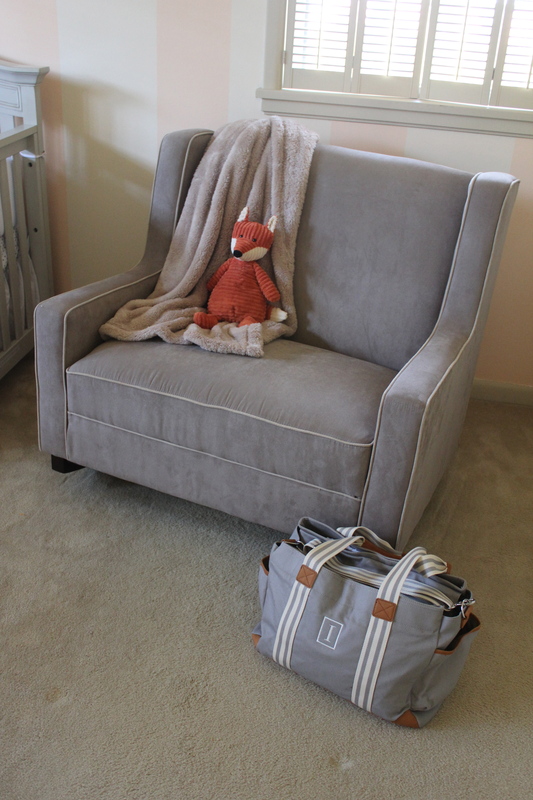 While I really loved this wingback rocker from Pottery Barn Baby, we ended up going with this one I stumbled upon on Walmart.com. Loved the colors, and it was a tiny fraction of the price, so figured it was worth a gamble. And it paid off! It’s a tad big and doesn’t rock that awesome on the carpet, but it’s definitely worth the price. Oh, and it’s wide enough for me to sit Indian style, which was a surprising plus that I am thrilled about! I found this JellyCat fox stuffed animal for Baby Girl while in Steamboat for Christmas, and my stepmom bought us this softest-ever blanket for the nursery for Christmas. Love it too! We decided to go with the beautiful Bonavita Westfield collection in Linen Grey. 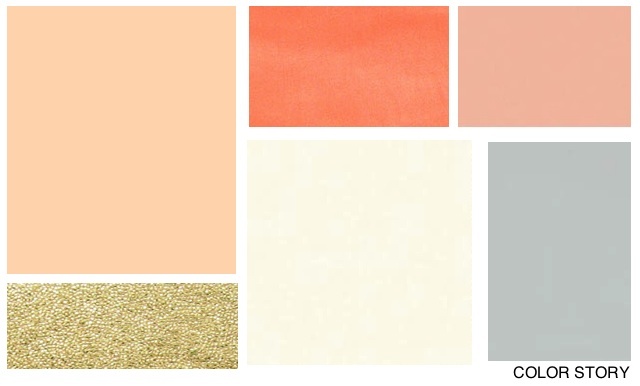 We love the color to complement the peachy wall colors and stripes, and the foxy orange pops we’ve added into the décor! Mrs. Susanna Christensen made me that gorgeous leopard and pink flower burp cloth … it’s so amazing and pretty, I don’t know how I’m going to stomach letting Baby Girl actually spit up onto it. LOL. I think Sue needs to add these to her loveme apparel line! She’s sell a ton as gifts! Adore. 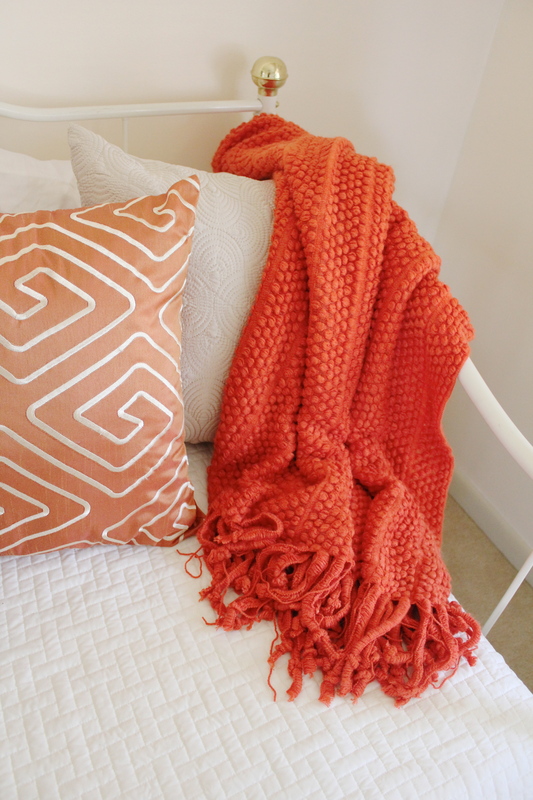 The orange, pink and hot pink blanket was handmade by my sweet co-worker Kim. It’s the softest thing EVER. And the yellow with multi-colored trim behind it was knitted by my late PopPop’s sister, my Great Aunt Milly. 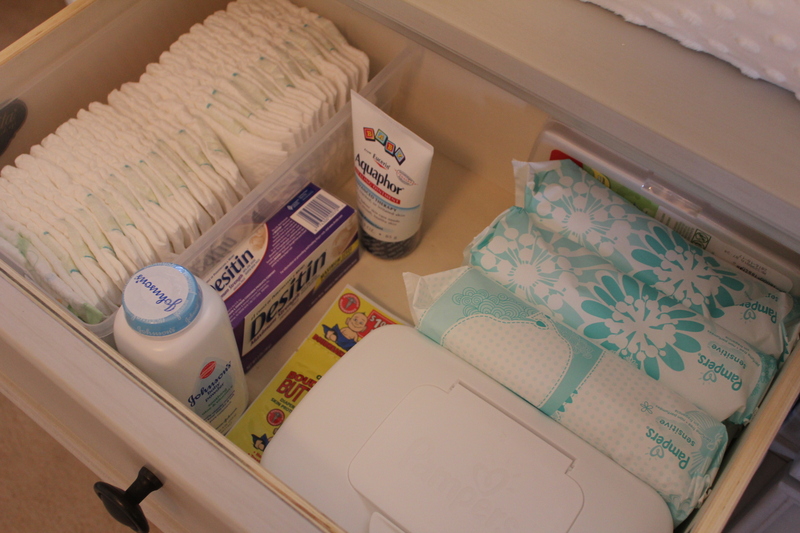 Did you know that I’ll change my very first diaper EVER, when Baby Girl arrives? I’m sure it’s easy, and not as nasty as it seems since it’ll be my little one. I’m glad hers will be my first. This was Michael’s little sister’s daybed in her room as a young girl. 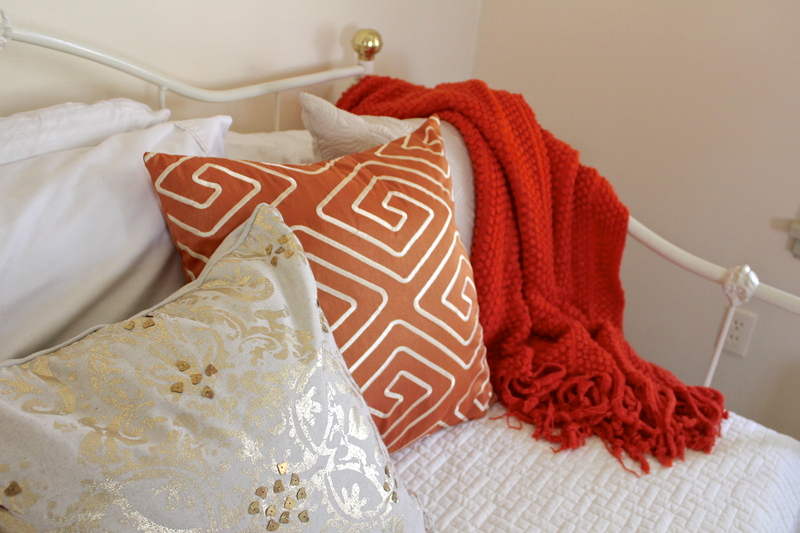 I love when people mix contemporary elements with traditional, which is what’s happening in my nursery. Some modern decor meets traditional homey stuff. 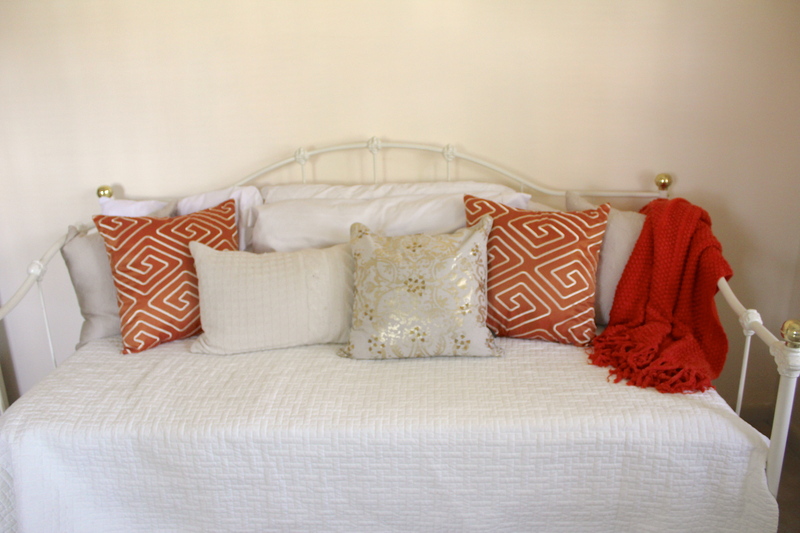 Instead of painting the brass knobs on the day bed that kind of date it to the 80s-90s, I’m using metallics in the pillows and in a lamp on the dresser to tie those in. And again, I love having a piece of furniture with history. 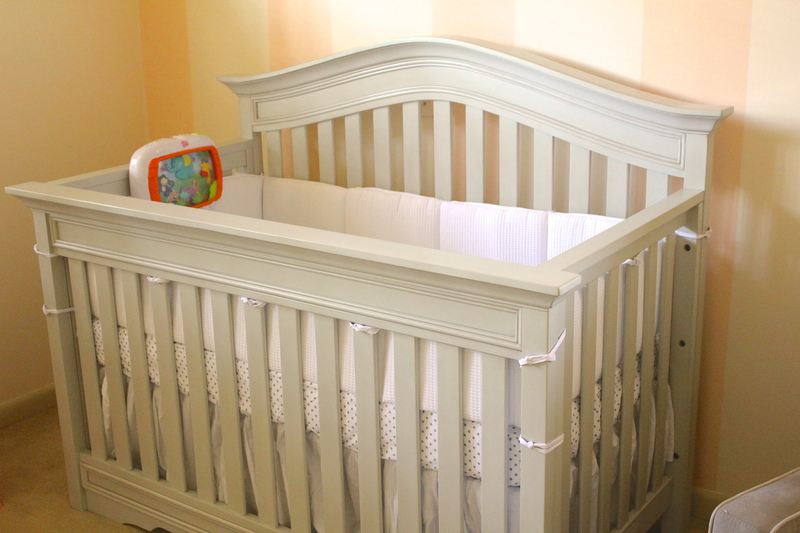 Baby Girl will use her Aunt Andi’s bed—so cute! You know, Cash always has to make an appearance! Love the little wooden ultrasound photo that my friend Stephanie made for me! 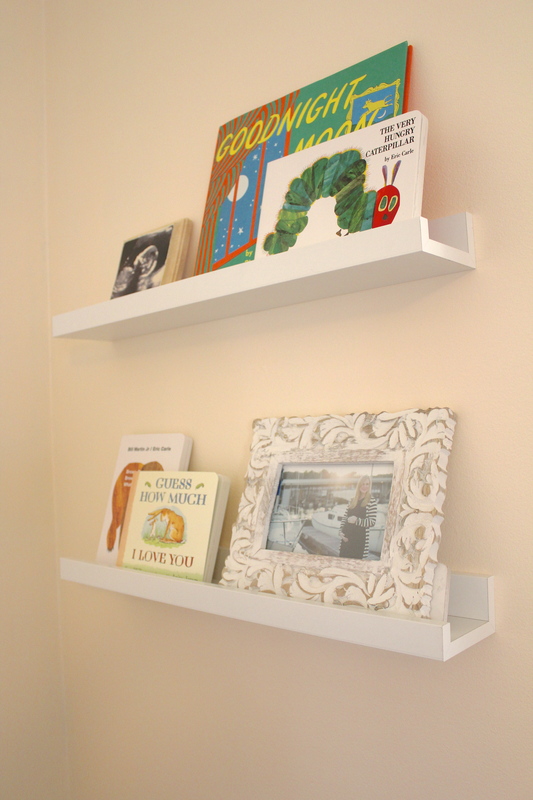 PS: The DIY Window Bow Hanger thing I was going to hang in the nursery … well, I changed my mind. Room doesn’t need it and I’m kind of thinking it might make the room look cluttered. 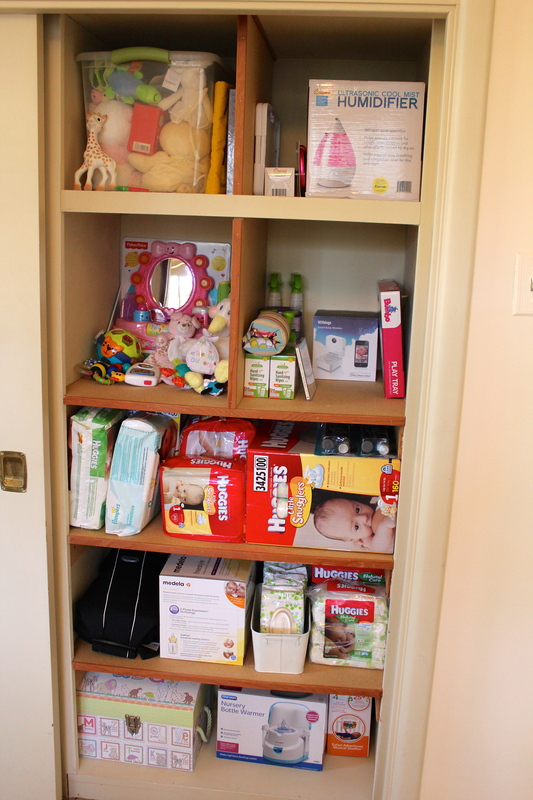 We’re stocked up and ready thanks to our generous friends and family. We couldn’t have done this without you and we’re so grateful! 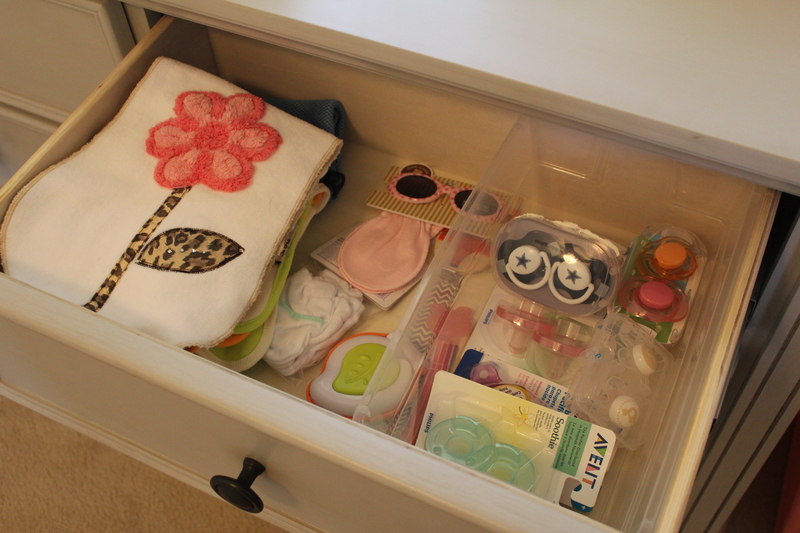 Everyone so happily gave awesome things for Baby Girl to use and enjoy — we’re so excited to see her wear your outfits, play with your toys, read her your books and keep her healthy and happy with all her supplies! Thanks so much to you all! XO. We are totally in LOVE with our baby monitor. It’s a Withings Smart Monitor! It monitors the baby via audio and video; it works with your iPhones, so no need for extra parts; it monitors room humidity and temperature; it sends you notifications if there is movement in nursery, noise in nursery, or if the temp or humidity reach an undesired level; it has a night light you can change to any color on the spectrum; you can talk to the baby through your iPhone into the monitor so you can soothe her; grandparents or loved ones can be given access codes (if you want them to have them) so they can log in and see the baby from time to time too; and it plays music for the baby! You gotta follow the link and watch the video about it! LOVE the painting Kristin did for Baby Girl (top left). About to pop (or at least it feels like it!)! Who knows… The next time I post, it might include a photo of our Baby Girl ! 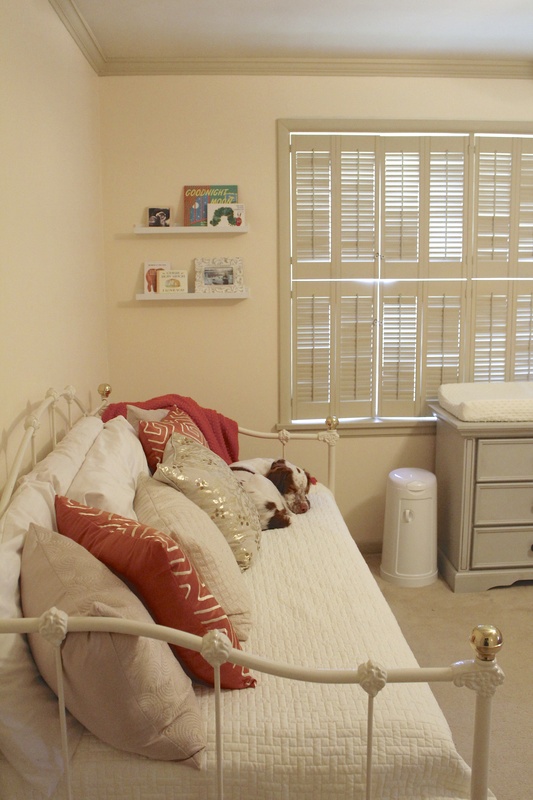 That nursery is so stinking cute! I love everything. Beautiful! I’ve never seen a fox-themed baby room, but if I ever have a baby one day I’m totally stealing this idea 🙂 Wishing you all the best! Thanks for the shoutout! 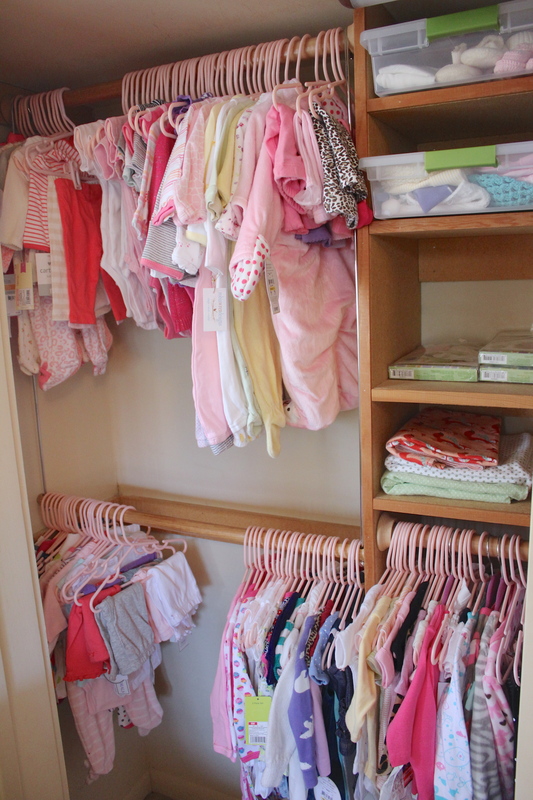 This is the cutest baby girl nursery. 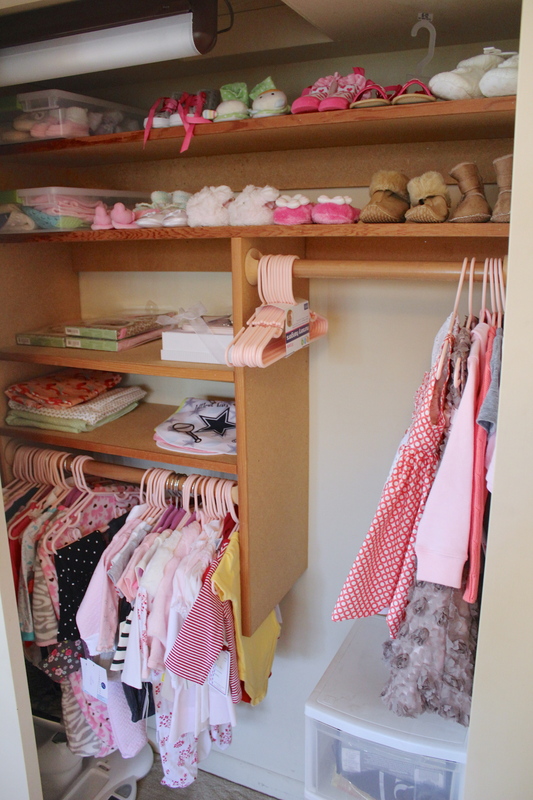 I LOVE seeing my closet dividers put to use. Everything goes together perfectly! Thanks again! 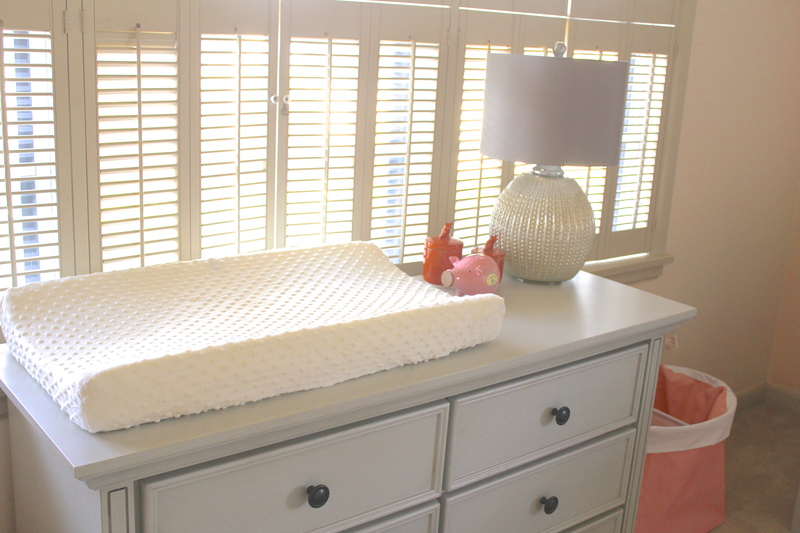 Your nursery looks beautiful! Great job! What price did you get? I am desperately looking for that lamp for a friend! Can you take a peek and see if you can find a brand name? 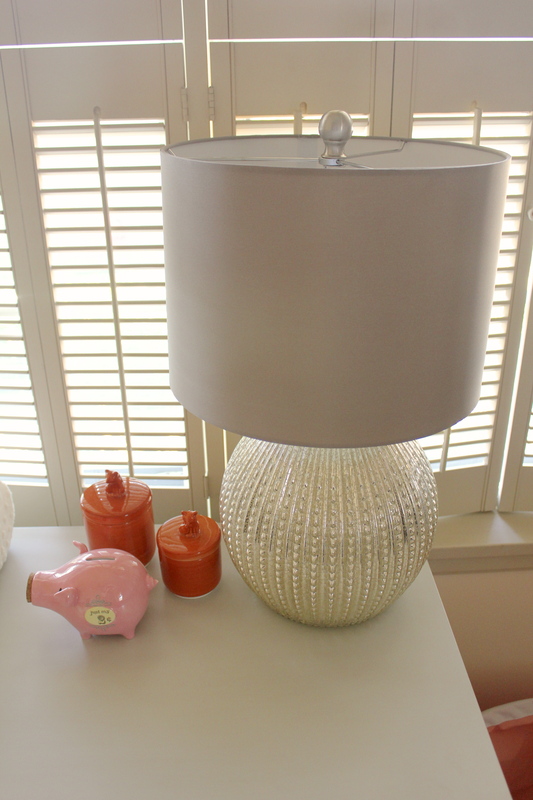 I know that TJ MAxx hasn’t sold it in awhile, but I’ve made it my personal mission to find that lamp. Can you email the brand to me if you can see it? supersebold@gmail.com. THEY HAVE IT AT HOMEGOODS RIGHT NOW IN LITTLE ROCK! JUST SAW IT AFTER CHRISTMAS! But I will look tomorrow too when my baby is awake. We don’t have a home goods were I live. 😦 The closest one is two hours away! Pingback: First Birthday Party: Sweet Little Peach, Georgia Peach, Sweet Tea Theme, Southern Baby Girl First Birthday Party | mrs. & the misc. Hey there! Just came across your post and was curious how that rocker is holding up. Can you let me know? Thanks!